Bone and joint deformity associated with diabetes is caused by a lack of sensation in the foot associated with repetitive minor trauma, leading to severe deformity called a Charcot deformity (neuroarthropathy). If left untreated these may lead to ulceration, infection and amputation. Special shoes and braces are used to protect the foot, and if severe, surgery may be required to correct the deformity. Dr Beischer has undertaken fellowship training with both Dr James Brodsky (Dallas, Texas) and Dr Lew Schon (Baltimore, Maryland) who are widely regarded as world leaders in the orthopaedic management of the diabetic foot. On his return to Australia, Dr Beischer established the orthopaedic diabetic foot service at the Royal Melbourne Hospital and has taught modern surgical techniques for the treatment and salvage of the diabetic foot to local orthopaedic surgeons and those from around the country. Intraoperative photograph following surgical treatment of a diabetic patient with extensive midfoot bone infection. 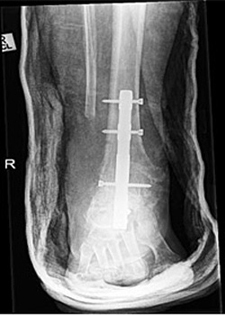 A special external fixation device has been used to hold the bones of the foot in place while healing occurs. Our surgeons are experienced in innovative new techniques for management of severe hindfoot deformities and arthritis – often related to neuropathy. 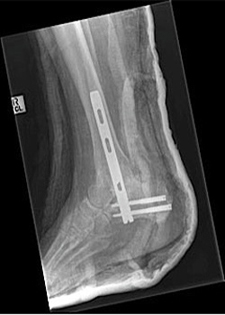 Once such technique is the use of rigid internal fixation with a hindfoot reconstruction nail. This allows for stable and solid fixation in what is sometimes very soft bone. These are X-rays of a patient who has undergone a tibio-talar-calcaneal arthrodesis (fusion) with the Panta nail.